Sound design of educational software stems from the science of multimedia instruction. Multimedia instruction is a type of instruction where the teacher exposes the student to a carefully constructed environment of words, images, and sounds, in order to foster learning (Mayer, 2014). Therefore, just as in the case of any type of project that targets learning, instructional designers should start off by writing the educational objectives for each learning unit, be it a digital lesson, a game, an online course, etc. According to an instructional design guru, a learning objective is an intended change in the learner’s knowledge (Mayer, 2014). We should identify the desired changes in the student knowledge during the needs analysis phase of the project. For example, we may want to teach basics of multiplications to 3rd grade students. Hence, after having gone through the digital lesson, a 3rd grader should be able to multiply correctly with one digit numbers. We can only observe the change in behavior, i.e. in this case: being able to multiply versus not being able to multiply; hence the educational objectives are always correlated with the assessment activities planned – in most cases – for the end of the learning unit. How are learning objectives classified? Creating - social networking for learning purposes, etc. As products designed on game-based learning theory, the Dacobots educational games are intended for student self-paced study and aim to supplement (not replace) classroom instruction. Testing – a summative assessment to measure the students’ understanding of the concepts being taught. 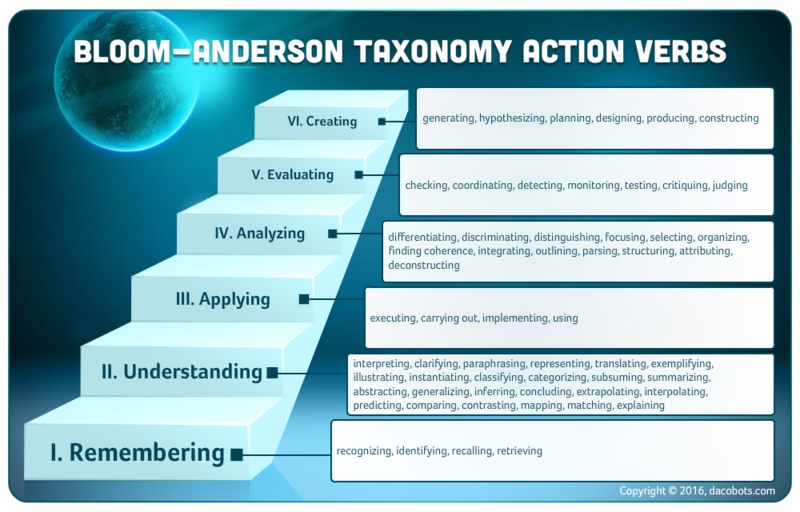 The steps were taken to ensure that the learning activities included in the Dacobots games were created while taking into account the Bloom-Anderson Taxonomy of Learning Objectives. We initiated the process with the identification of the intended knowledge dimensions and cognitive dimensions starting from several curriculum documents from the United States (Common Core State Standards for ENGLISH LANGUAGE ART S & Literacy in History/Social Studies, Science, and Technical Subjects), the UK (English programmes of study: key stages 1 and 2. National curriculum in England), as well as curriculum framework for Science and Mathematics for 4th and 8th grades for the Trends in International Mathematics and Science Study (TIMSS). Based on the same documents, we clarified the intended learning outcomes of each Dacobots game. Next, we wrote the learning objectives as statements that contain an action verb associated with the intended cognitive process and an object describing the knowledge which students are expected to acquire (Anderson and Krathwohl, 2001, pp. 4–5). 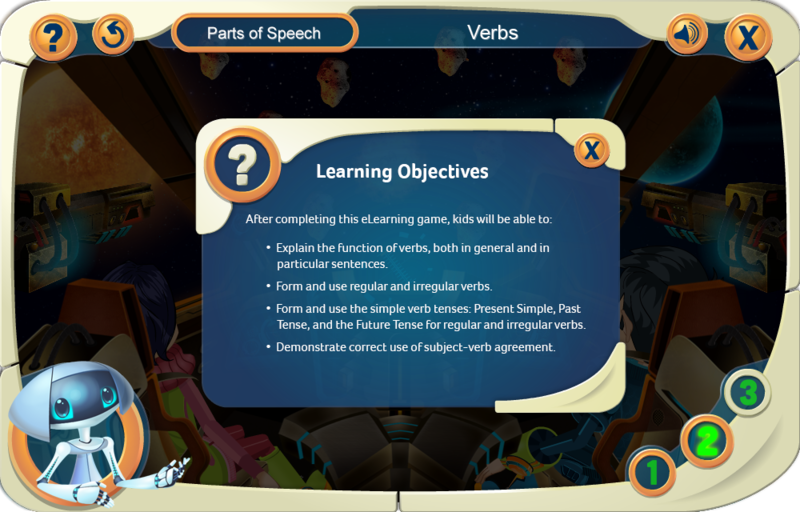 The image below is an example of the learning objectives of an educational game about Verbs, from the series Parts of Speech, targeting 3rd grade students. Finally, the summative assessments in the Testing unit were formulated in such a way as to measure the intended learning outcomes. Mayer, Richard E. (2014). Research-Based Principles for Multimedia Learning. Harvard Initiative for Learning and Teaching. May 5, 2014.